Some people tend to over explain certain things, wanting to clarify every detail. This can be helpful in some situations, but at times it can get a little bit overboard. 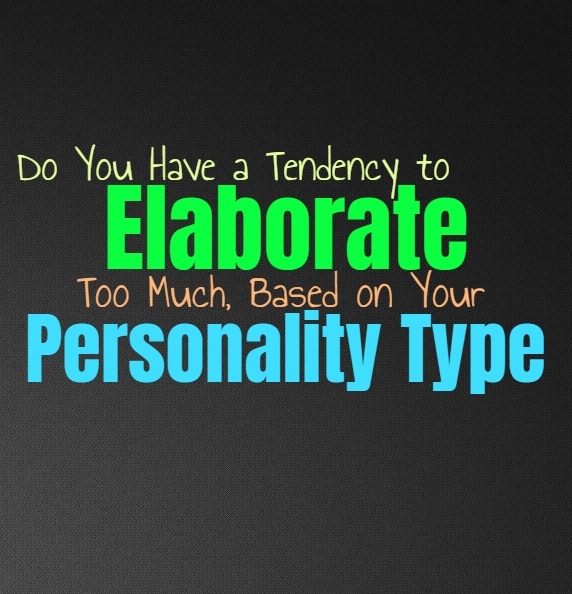 Here is how likely you are to elaborate a bit too much, based on your personality type. Most of the time INFJs can keep things to themselves, but when they are truly passionate they might have a tendency to over explain. When there is something that takes hold of their thoughts and imagination, the INFJ can find themselves elaborating a bit more than people want or need them to. They simply enjoy being able to dive into this things which inspires and excites them, especially when they are around someone they love. They especially enjoy being able to showcase their personal skills and knowledge to those around them. ENFJs do sometimes elaborate too much, especially when they are excited about a story they are sharing. They don’t mean to over explain the details, they are just very passionate people who become caught up in certain things. When the ENFJ is really eager to explain something to a loved one or friend, they don’t want to miss any of the important parts. Sometimes they over explain so that people don’t feel bad because they don’t quite understand something. This comes from their desire to be sensitive to others, and help feel like they can connect to the ENFJs story. INFPs don’t want to over explain things when they don’t need to, but there are times when they can become sincerely passionate about something. They are capable of expressing most things in a simple way, especially if it isn’t something they are overly excited about. When the INFP is emotionally connected to a project or hobby, then they might find themselves going on about it for a while. They don’t necessarily over explain about unnecessary details, but they can discuss their own feelings about it for a long time. INTJs do believe in being thorough and want to be able to elaborate when necessary. While they are highly capable of explaining things in great detail and length, they don’t like wasting time. They value efficiency and so for the INTJ over explaining something is not something they seek to do. They want to be sure they are giving all of the pertinent information and details, but won’t spend their time going overboard and elaborating when they really have explained enough and don’t need to go on further. ENTJs don’t like to do anything without a sense of focus and efficiency, and so they don’t necessarily elaborate too much on things. They believe in giving the right amount of details and information, and not too much. ENTJs are certainly capable of going into great detail with most information, but they realize this isn’t the most effective way to teach someone and get the job done the right way. So for the ENTJ over explaining isn’t a smart move and they do their best to focus on giving just the right amount of information. INTPs can certainly go off on tangents explaining things and expressing their thoughts, but at the same time they don’t necessarily over explain. They can leave out certain details and don’t need to get into the parts of something which seem wasteful to explain to someone else. INTPs simply have such active and vivid imaginations and so when they go into detail about something it is involving their own theories and analysis. ENTPs can certainly go into detail about things but they don’t feel the need to over explain. They might do this if they are around people who seem a bit lost and need that extra information to help them follow what the ENTP is saying. For the most part they are capable of getting to the point and explaining things in a way that is clear and accurate. ENTPs do have vivid imaginations and so if they wanted to they could elaborate for days, but they don’t always feel like this is useful. ISTJs are very focused on efficiency and so they don’t like spending too much time explaining something when they shouldn’t. They will express things clearly and precisely, and become annoyed with people who constantly feel the need to go into pointless detail. ISTJs are more interested in getting things done to the best of their ability and become drained with needing to over explain something when it is expressed rather clearly. ESTJs don’t usually over explain with most things, instead they prefer to remain accurate and to the point. They value efficiency, and so for them spending too much time elaborating is a waste of time and energy. ESTJs believe in simply explaining things in an accurate and clear manner, so that people can understand the information and use it to the best of their abilities. They become drained with people who feel the need to explain something to death, and feel this is wasteful. ISFJs certainly believe in explaining things so that others can understand, but they don’t like wasting too much time going into pointless details. With most things the ISFJ likes being direct and to the point, especially when they are focused on getting something done. While they are nurturing and compassionate people, they are also rather hardworking. They want to be able to get things done perfectly, and so over explaining can prevent them from doing this the way they need to. ESFJs really don’t like over explaining, especially when it is not necessary. They will certainly do their best to elaborate when someone is confused and really needs to understand the situation better. They want to make people feel comfortable and so when they do over explain it is often for the sake of someone else. Most of the time ESFJs prefer to give the right amount of detail and don’t want to find themselves elaborating until people become bored and don’t want to hear about this information any longer. ISTPs do sometimes find themselves elaborating on details a bit too much. They do become rather focused on the more specific details about things and enjoy diving in deeper. This can cause them to explain things in a way that others might deem unnecessary. ISTPs simply enjoy being factual and accurate and something this means it is important to share even the smallest of details. ESTPs definitely have a tendency to over explain or elaborate a bit too much when they are discussing something. They find themselves going on about the details of a situation or hobby for a rather long time and this can seem like a bit too much to others. When the ESTP is discussing or explaining a story they often go into detail and want to explain even the smallest of facts about what happens and what was around them when it did happen. ISFPs do enjoy being able to go into detail about things, especially when they are explaining a story. They don’t do this around strangers but can certainly elaborate a lot when they are around someone they trust. ISFPs do this because they become so wrapped up in remembering all of the details and they want to be able to recreate this situation for someone else to completely understand and follow along with them. ESFPs do have a tendency to over explain, especially when they are talking about a story or something they are personally passionate about. They find themselves going into detail and can often elaborate much more than people would ever expect. ESFPs have vivid memories and enjoy being able to focus on even the smallest details in order to bring back a story or something which truly excites them. If you want someone who will make a long story short, you certainly aren’t looking for the ESFP.